Ponte Vecchio in Florence. more then an Old Bridge. Ponte Vecchio is one of the symbols of the city of Florence and one of the most famous bridges in the world. It crosses Arno river in its narrowest point, where in ancient times there was a ford. 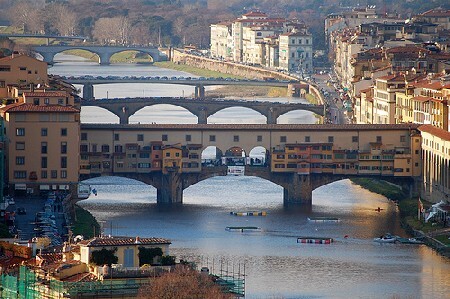 It is the oldest bridge in Florence and the only one spared by the vicissitudes of the Second World War. The present building dates from the fourteenth century, but was originally built by the Romans and around it grew the Roman colony of Florentia. During its history hosted the first workshop of leather tanners and butchers. The early craftsmen found convenient and easy to work on the watercourse in order to directly dispose of waste of their work. In the Middle Ages became the seat of the goldsmiths, who divided into many small shops, still existing. At the centre of the bridge, opening on both sides there are arches offering a very suggestive view on the river. Its main feature, the one that strikes the imagination of anyone looking at it, is the presence of buildings taken over across the bridge. 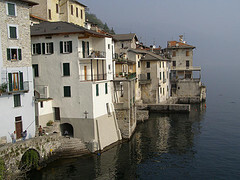 They are small buildings that constitute a genuine extension of the road and the life along the river. In practice there are two rows of shops interrupted in the middle by a panoramic terrace. Now it is the only bridge that has kept this characteristic today considered very unusual, but it was not so rare. Most of the Florentine bridges were bridges “built” with the shops above as Ponte Vecchio, for example, also the Ponte alle Grazie was full of shops and there were also several votive chapels. On the left side of the bridge, the Vasari Corridor passes above the shops. It is an air passage which was built by Grand Duke Ferdinando de ‘Medici in the 500 to connect Palazzo Vecchio, the residence of the Medici and Palazzo Pitti, without necessarily having to be confused with the mob and the populace in the streets. But Ferdinand was also a bit snobbish, and didn’t loved to walk over Ponte Vecchio, where there were those shops with their smells, so he sent them away and called the far more noble and elegant goldsmiths to occupy the shops. It is possible to visit the Vasari Corridor, deserves, but it is necessary to organize the visit first because the entrance is allowed only by appointment and in a few fixed days. At the centre of the bridge there is a small balcony, where the bust of Benvenuto Cellini is located. He was the most talented and famous Florentine goldsmith. Ponte Vecchio is a more then a symbol. It is full of history and full of modern life.